Suite consists of four movements. There are the lovely romantic 'Bridal Morning', and 'Intermezzo (Garden Scene)' movements with their beguiling melodies. Dogberry and Verges (March of the Watch) anticipates the jolly bombast of the Sherwood Forest music from The Adventures of Robin Hood; and the suite concludes with the merry Masquerade (Hornpipe). Sheer magic. Toscha Seidel was born in Odessa in 1899. He settled in California in the 1930s and made his career in Hollywood. He led the MGM studio orchestra for many years and featured in the soundtrack for the Ingrid Bergman and Leslie Howard film, Intermezzo. Provost's Intermezzo (one of those tunes we all know but cannot put a name to) was the film's title track and it is included in this collection. Seidel had studied with Max Fiedelmann before joining Leopold Auer's violin class at the St Petersburg Conservatory. 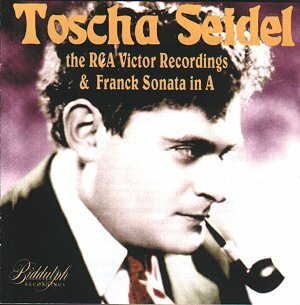 Jascha Heifetz, already in Auer's class, had been dubbed the "Angel of the violin" but Toscha Seidel was soon to be called "Devil of the Violin" due to his intensely vibrant sound and impassioned style - ideal for the world of film music. Film music connections are prevalent throughout this collection. Bakaleinikoff's Brahmsiana concoction was performed in the RKO film Melody for Three. But the other highlight on this disc has to be the sparkling arrangements by Dimitri Tiomkin (with words by Oscar Hammerstein II) of three Strauss Waltzes featured in The Great Waltz, MGM's 1938 biopic of Johann Strauss Jnr. Here Seidel accompanies the glamorous coloratura soprano, Miliza Korjus. These recordings vividly capture Seidel's glorious tone and reveal a mastery of the instrument and sensitive musicality. There are his amazing trills in the Mozart Minuet in D, for instance, and his ravishing reading (with pianist Harry Kaufmann) of Cesar Franck's Violin Sonata in A. This is a complete performance and it is the most substantial work in this generously filled compilation. It was recorded in the early 1950s for Impressario Records).